Did you know that Patti Smith’s biggest commercial hit song was cowritten by Bruce Springsteen? It is true! “Because the Night” was originally intended for “Darkness on the Edge of Town” (I think I’ve mentioned this album three times on this blog in the last month). Patti Smith was recording Easter next door, and they were constantly exchanging tapes. 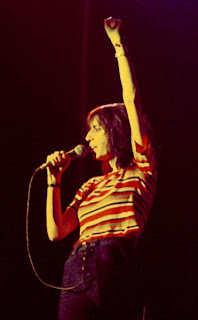 When Bruce couldn’t find a place on the album for “Because the Night,” Patti Smith recorded it for Easter and released it as her first single. She changed the arrangement from its original “latin” feel to what you hear now, and changed the some of the lyrics to a more feminine perspective. The original Bruce Springsteen version hasn’t been released, however Bruce was playing the song live on his tours, and you can hear his version on the Live 1975-1985 boxset. It is excellent! He kept Patti Smith’s rock arrangement, but changed back some of the lyrics to his original version. Listening to the song with this knowledge, you can see how this is clearly a song from Bruce Springsteen’s “Darkness on the Edge of Town” days. The song touches on the loneliness, uses night as a motif, and has a familiar structure instantly recognizable by any Boss fan. I’d really love to hear the original version – perhaps on some uber Bruce box set. If you make someone a copy of Easter, always include Bruce’s version as a bonus track! They both rock so hard! I would love to hear Bruce and Patti team up on a project – it would almost be a dream pairing. They can’t hurt you now…. Comedy. I like to laugh.